Clarin was founded in 1925 by Werner Clarin, the innovator of all of the principle designs that are presently offered by folding chair manufacturers. Of all his designs, Clarin selected the X-type, double tube and channel design for its superior strength and flexibility characteristics over the original tubular chair. 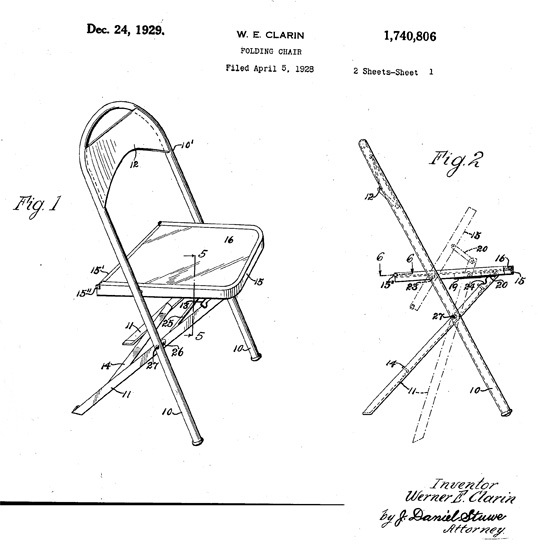 In 1928 Clarin Corporation made the first all-steel folding chair manufactured in the United States. Werner Clarin obtained the backing of a small group of investors and the company grew steadily. World War II material shortages actually helped the company’s growth when it switched to wood folding chairs and government sub-contract work to stay operational. After World War II, the demand for portable seating increased greatly because of the rising enrollment in public schools, and Clarin grew steadily as the market did. Providing aesthetic as well as practical appeal, the comfort and durability of Clarin chairs is legendary. Known for providing years of dependable service, it is not uncommon for schools and venues to still be using Clarin chairs dating all the way back to the 1960’s and 70’s. In 2011 Clarin became part of the Hussey Seating Company’s family of products. Another veteran American seating company, Hussey’s complementary product lines serve the same markets as Clarin. Like Clarin, Hussey Seating also has a long pedigree of durability, quality, safety and serving the customer, making it an ideal home for America’s most popular folding chair. Winners have been sitting on Clarin portable chairs for years – from nearly all the NBA teams nationwide to high school athletes in your neighborhood. Still American made to this day, Clarin chairs continue to be the leaders in the market. Clarin chairs can be found in the foremost arenas, stadiums, convention centers, universities, schools, offices and entertainment facilities throughout the country and around the world. Fun fact: Clarin date stamps all of their folding chairs – when were yours made?